These words, from the corner of the one himself, DR. APJ ABDUL KALAM, not only enlightens us all on the definition of a true leader, but also highlights the ethics and values that a person needs to inculcate, to be addressed , and respected, as the real “boss”. Comethour college life, comes the phase where we actually start living our life to the fullest, and rejoice in that sweet scent of freedom we got our hands on.This transition not only brings with itself a plethora of opportunities to learn and grow, but also rekindles the spirit of innovation, courage and leadership within us all. We all have that burning desire to lead from the front, to build something from the ground up, and ascend it to an eternal greatness. But a very few manage to lay their hands on that elusive chance, and the rest tend to fall back, however talented they might be. But hold on fellas, as all that’s about to change. As we, at the Chitkara University Centre for Entrepreneurship Education and Development, plan to set the ball rolling for one of the biggest search for all those decisive, courageous and charismatic leaders, through its E-Leader programme. What is that you ask? An opportunity to put your inner leader to test, a shot at building your own team, and competing head to head against other formidable competitors in a one month long extravaganza. Sounds exciting, doesn’t it? 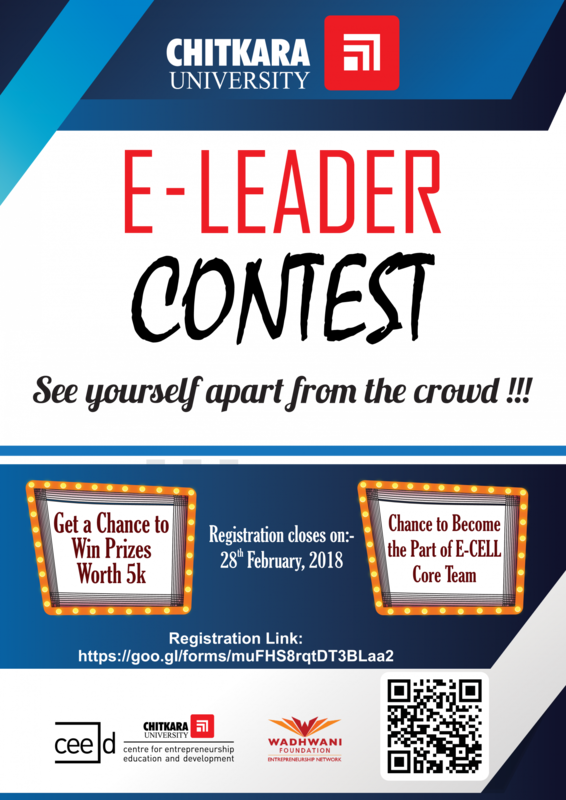 With every event and idea fully supported by the E-CELL, Chitkara University, leaders and their teams will gain a sterling exposure and will gain a taste of how to work within a team in the corporate world. With the winner earning an opportunity to work as the core member of the organising team of the E-CELL, Chitkara University,plus the motivation, confidence, and cheers gained with that certificate of appreciation, makes for a compelling package. So, what are you waiting for? Get your team a nifty name, head over to the link in the poster below for registration, then buckle up and be part of this incredible learning curve, which always was, your dream ride. Chitkara University Centre for Entrepreneurship Education & Development (CUCEED) has indeed imbibed this rhythm of igniting young minds to nurture the Nation’s vision of STARTUP INDIA-STAND UP INDIA. The journey has just begun with firm footholds to conquer the plethora of opportunities wherein students, faculty, alumni and community entrepreneurs get the belongingness of a company.